Do you want more exposure for your Twitter account? Have you thought about applying SEO tactics to your Twitter marketing? With a few simple techniques, you can increase the chances that your Twitter account shows up in both Twitter and Google search. In this article you’ll discover how to improve the visibility of your Twitter account with SEO. 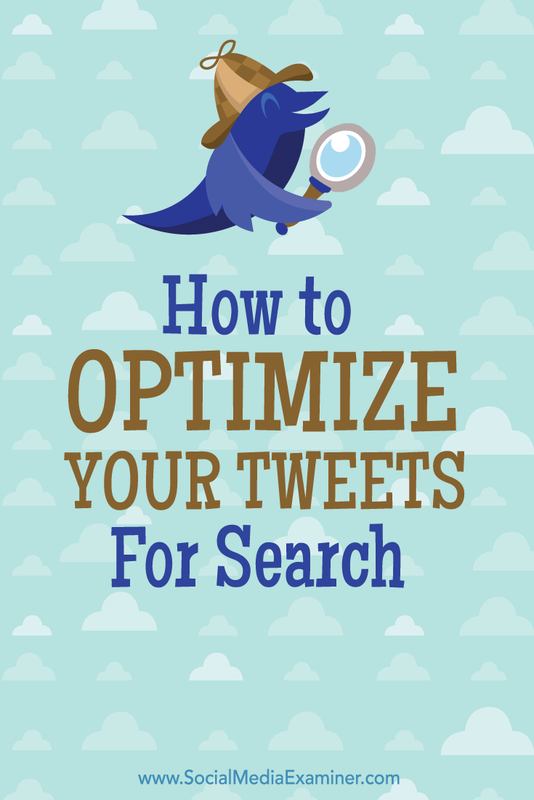 Discover how to optimize your tweets for search. Keywords that you’re already using in the metadata of your website are a good place to start. Your website keywords might not translate perfectly to Twitter, but if you combine them with popular hashtags and topics that work well in your content, you’ll have a good group to test. You’ll know which keywords are working best by monitoring your engagement, link clicks and reach. Any spikes in those metrics will show you which tweets have effective keywords in them. Then you can use those keywords more in your tweets and profile. 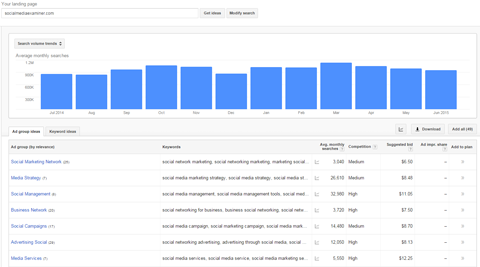 Google’s Keyword Planner helps you find relevant keywords. You can also expand your keyword list by including the names of events that your company is always involved with. Make the list as big as you like as long as every word is relevant to your brand. Most importantly, keep this list updated. With your keywords in hand, here are some ways to boost your visibility for both Twitter and Google search. Tweets get the main stage on Google right now, but optimizing your account for search on Twitter will allow you to have long-term searchability. Make sure your handle and username match your website and brand name. Consistent branding across all of your channels is your best bet for being found by the audience you want. Your handle and username don’t have to match each other, but they should be related. 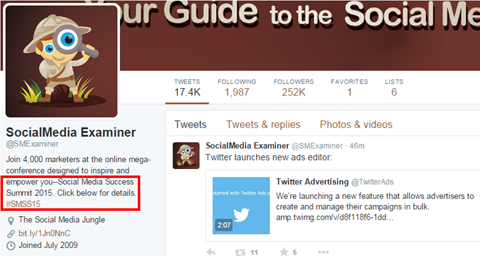 Your handle is also included in your unique Twitter URL (for example, https://twitter.com/SMExaminer). Your username shows up next to your profile photo for all of your tweets. Use your keywords (for example, “social media”) in your image and bio. You can change your username easily. But changing your handle is trickier, and you’ll lose your verification badge if you have one. Changing your username or handle may also confuse your followers and cause people to unfollow you. If you’re going to change either one, try to do it only once. Don’t use a lot of numbers in your username either because Google may flag it as spam. Your bio, photo and link are the places to make changes and updates to promote campaigns or events. Twitter indexes your bio regularly, so any changes affect your relevancy score in search. You can use up to 160 characters in your bio section, so make the most of them. The bio’s main purpose is to explain to potential followers what you usually tweet about and why they should follow you. Update your bio regularly to match the type of content you’re currently tweeting about. If you have a campaign or event you’re involved with, make sure you include relevant keywords and hashtags in your bio. This will help you show up more on both Twitter and Google when people search for those keywords and hashtags. If you’re holding an event, promote the event and hashtag in your bio. The profile photo also has some SEO weight. Before you upload the photo, add relevant keywords, separated by dashes, to the filename of your photo (for example, social-media-examiner.jpeg). This won’t make you shoot to the top of results on its own, but SEO tactics are most successful when the different pieces are working together. Also make sure your photo is exactly 200 x 200 pixels for optimal loading speed. Your link is the biggest call to action for your Twitter account. Many brands shorten their URL to make it more trackable and user-friendly. If you want to shorten your URL, get a branded link shortener because some link shorteners can be flagged as spam. Also think carefully about which page your bio link is sending your Twitter followers to. The safest option is to use the main page of your brand’s website because it usually has the best SEO authority. You can use special landing pages for campaigns, but only if they’re more relevant to your followers than your website’s homepage. Don’t forget to provide a link to your Twitter account on your website. That mutual link love not only gets you more traffic and followers, it also gives your account more authority. The more places that link to your Twitter account, the more credible a source it will appear to search engines like Google. Make sure to include a link to your Twitter account on your website. You can also add your Twitter account link to your blog, Facebook page, LinkedIn profile, YouTube video descriptions and newsletters. And be sure to submit your Twitter profile to popular Twitter directories (such as Twitaholic and Wefollow) to catch the eye of influencers trying to increase their authority as well. Google lets you embed code in your website to specify your preferred social accounts, like Twitter, to include in search results. 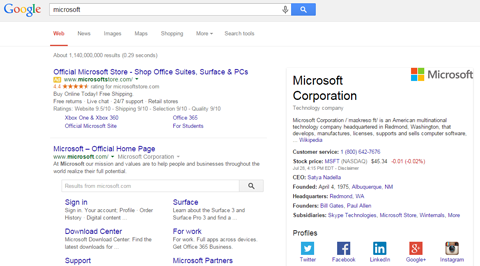 For example, Microsoft’s social profiles are displayed in the Google knowledge panel on the right in these search results. 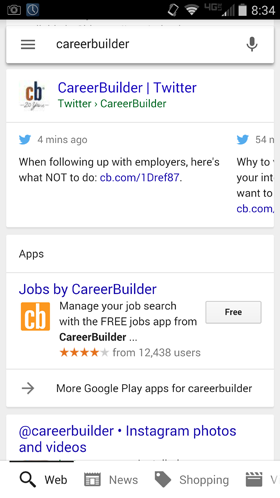 Google lets you include your social profiles in search results. In addition to your Twitter profile, you can specify your profiles for Facebook, Google+, Instagram, YouTube, LinkedIn, Myspace, Pinterest, SoundCloud and Tumblr. All you have to do is grab some code from the Google Developers site and drop it onto your website. Every time you tweet, you have the opportunity to show up in Google search results for a topic that your customers and prospects care about. While your tweets may not last as long at the top of search results as a website would, you get more chances to be relevant through your tweets. Make sure you’re constantly testing and varying your content to see what works. You can use Twitter analytics to review your tweets and find out what’s working best. When you find something that sticks, make sure to expand your content plan to give you more ways to tweet about that particular topic. Every tweet is an opportunity for you to show up in Google Search. Put yourself in the shoes of people searching and think about why they search. Whether people are researching an event or trying to find out about the inspiration for the latest Taylor Swift song, they’re usually looking for more in-depth information than 140 characters can provide. That’s why rich media works best for Twitter search. Top new stories on Twitter usually have photos and links in them. The words in your tweet will show up on Google, but the images and links in your tweet will show up at the top of the search results on Twitter. Make sure to give your readers everything you can in each tweet. When it comes to Twitter, the more effort you put in, the better your results will be. 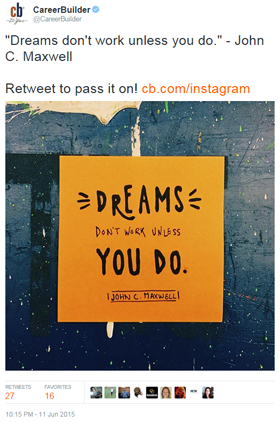 Other than Google and Twitter search, the most effective way to expand the reach of your tweets is with retweets. Unlike Facebook, there’s no penalty for asking people to share your content. Some of the most effective organic tweets end with a clear call to action. Include a call to action in your tweet. Make sure your tweets are short enough to retweet. The optimum tweet length for retweetability is fewer than 120 characters. This leaves room for other Twitter users’ handles in their retweets. Some handles are longer than others, but 120-character tweets should provide enough space to accommodate even the longer ones. Whenever you do a Google search, you’re creating a search stream just like Twitter does with Twitter chats. The only difference is that Google supplies a lot more content, and the change in the stream is much slower. Putting these two types of search together is a natural fit, especially since Twitter tracks keywords and hashtags in the Trends feed. Although there aren’t many tools that can measure each tweet’s exact reach, it’s a factor in the authority level that Google gives your Twitter account. Posting retweet-worthy content, having high-quality followers and tweeting at times when you have the most followers on Twitter are the best ways to attain a strong overall reach. The name of the game is getting good audience response to your content. All of these tricks are great, but they’ll never replace quality content. Always think of your followers first and SEO second. Algorithms change often, so make sure to always write for the humans reading your tweets, not the robots. What do you think? 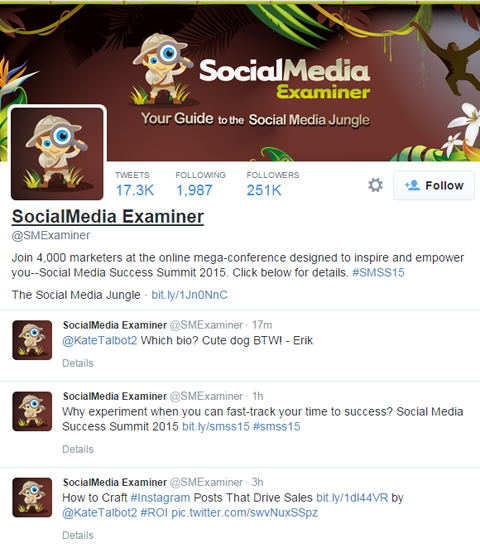 Have you tried any of these tactics with your Twitter account? Do you have any tips for expanding reach through Twitter or search? Let us know in the comments below. 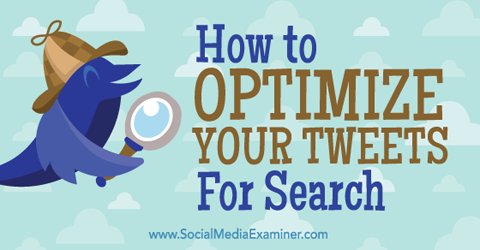 Tips for optimizing your tweets for search. Greg is the global social media strategist for CareerBuilder, the global leader in human capital solutions.